Dieser Download kann aus rechtlichen Gründen nur mit Rechnungsadresse in CY, GB, M, A, B, BG, CZ, D, DK, EW, E, FIN, F, GR, HR, H, IRL, I, LT, L, LR, NL, PL, P, R, S, SLO, SK ausgeliefert werden. Zum Urlaub in die USA? Selbst für Freunde Amerikas ist das eine heikle Frage, in Zeiten Donald Trumps. 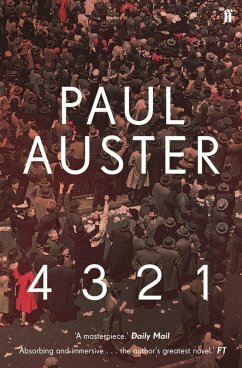 Doch es gibt einen wunderbaren Zugang zur Größe dieses Landes – Paul Austers Roman „4&hairsp;3&hairsp;2&hairsp;1“. Der Held, Archibald Ferguson, wächst in bewegten Zeiten heran, im Amerika der Fünfziger- und Sechzigerjahre. Protest gegen den Vietnamkrieg, Studentenrevolte und Rassenunruhen bilden die Kulisse. Bildungshunger treibt Archie an, er saugt die Weltliteratur in sich auf, schreibt Romane – und liebt Baseball. Archie ist kompliziert. Paul Auster macht es noch komplizierter. Er erzählt „4&hairsp;3&hairsp;2&hairsp;1“ in vier Episoden. Dreimal stirbt Archie, jedes Mal darf er weiterleben, allerdings unter veränderten Umständen. Mal bleiben seine Eltern zusammen, mal trennen sie sich, mal fühlt Archie sich zu Mädchen, mal zu Jungen hingezogen. Verwirrend? Nein, ein genialer Kunstgriff des Autors. Beides, Zufall und Charakter eines Menschen, bestimmen das Leben. Auster schuf eine Sinfonie in vier Sätzen – über sein eigenes Leben. Dabei genügt ihm ein einziges Instrument: Erzählkunst. Singelmann. Rowohlt Verlag, Reinbek 2017. 1264 S., 29,95 Euro. E-Book 26,99 Euro. “What if… “ – this is the question Auster plays with in his latest and longest novel. One life, the one of Archibald Isaac Ferguson, born on March 3, 1947 in Newark, New Jersey, son of Rose and Stanley Ferguson, is confronted with four different variations, each triggered by only slightly different decisions or single events. Thus, four times, Archie’s life and chances in life develop in another way. One time, he loses his father as a young boy; one time, the family becomes rich; one time, Archie makes a wrong decision and has to pay with his life at a young age. It is always the same boy coming from the same family, provided with the same talents and liking for the same girl, but by coincidence, things change and his life takes another road. 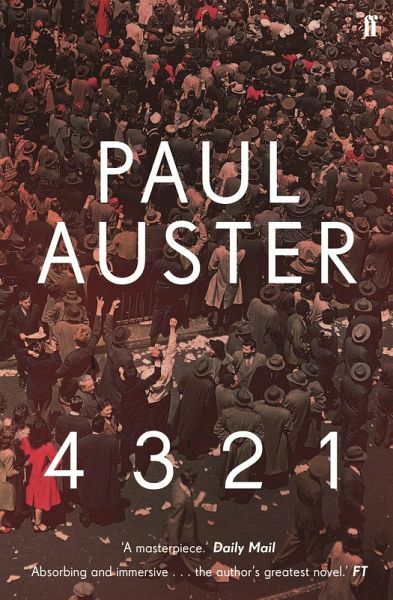 Due to its structure, Paul Auster’s novel is quite challenging to read. It is not only the 900 pages which demand some endurance from the reader, but the plot requires a lot of attention and concentration while reading. In seven chapters, we always get four variations of Archie’s life. I sometimes had struggles remembering which Archie we were talking about, the character itself did not vary that much, but the circumstances in which he was growing up differed a lot. At times, I was tempted to read the development of only one Archie from begging to end and then continue with Archie2. Thus, from a literary point of view, this novel is great work, especially since you can see the parallels between the four stories and the development of Archie’s identity which, in its core, remains the same but changes slightly according to the events in his life. It is interesting to observe within oneself as the reader that one likes one or the other version of Archie better, I definitely preferred Archie1 with his political interest already in young years, although I also had a liking for the Archie who was fond of French films of the 1950s and 60s. One of the add things about being himself, Ferguson had discovered, was that there seemed to be several of him, that he wasn’t just one person but a collection of contradictory selves, and each time he was with a different person, he himself was different as well. This self-reference or mise-en-abîme outline that there is not one story to be told, that we, in the end, do not know this is the original Auster had in mind, whose story he wanted to tell – and, transferred to real life, the is not the one way your life has to go and the one person you necessarily have to turn into. Apart from the complex study of Archie’s character, the novel also whooshes through the American history, from the European dreamers arriving at the beginning the 20th century hoping for a better life in the new word, over the prospering 50s, presidents Kennedy, Nixon etc. and culminating in the Vietnam war and the fear of Archie and his friends of being selected by the national lottery. As in other novels by Auster, we also find is masterly capacity of telling the story. I am always impressed by his language, the perfect way of putting the action into words which makes him, in my opinion, one of the greatest authors of our time.